We love making and receiving homemade gifts. Individually handmade presents feel so personal and special don’t they? This year we wanted to make some gifts for our grown-up family and friends and decided upon these gorgeous Tin Can Lanterns. I love how they turned out so much we’re going to make another batch so that we can keep some for home too. 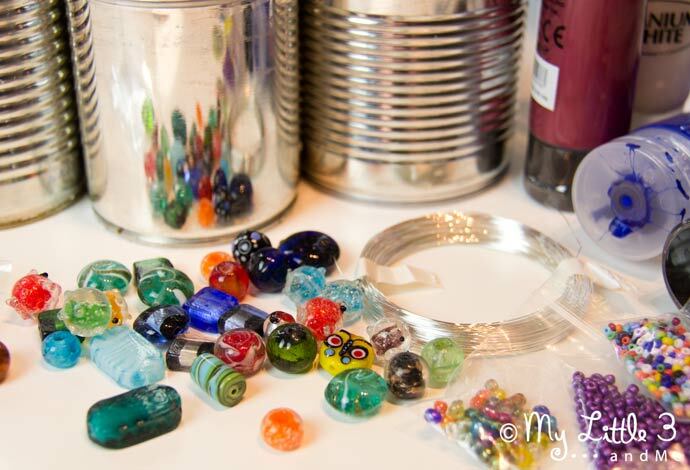 These pretty Tin Can Lanterns can be made in any colour and are finished off with some beautiful glass beads which were a bargain price and add that perfect special finishing touch (I’ll pop details of where to buy them below). When you pop a little tea light inside the lanterns the golden glow through the patterns is so pretty and they look lovely as inside or outside lights, perhaps sat on the mantlepiece or as patio lighting. 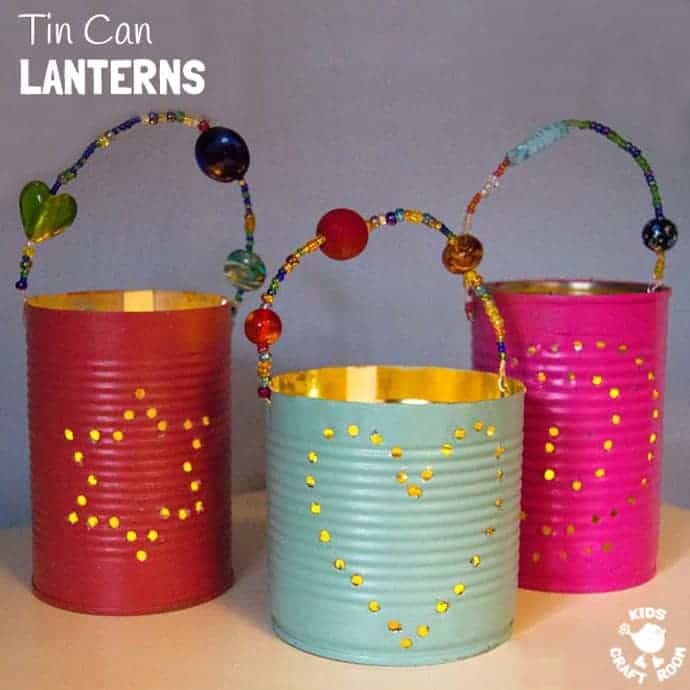 These Tin Can Lanterns are going to be our homemade Christmas gifts but they’d be great presents to make at any time of the year. I think our tea light lanterns look as nice, if not nicer, than any shop bought lanterns yet they’re extremely easy and cheap to make! I adore that they’re gifts that kids can make that any adult would love to receive. My youngest was 8 and he managed just fine. 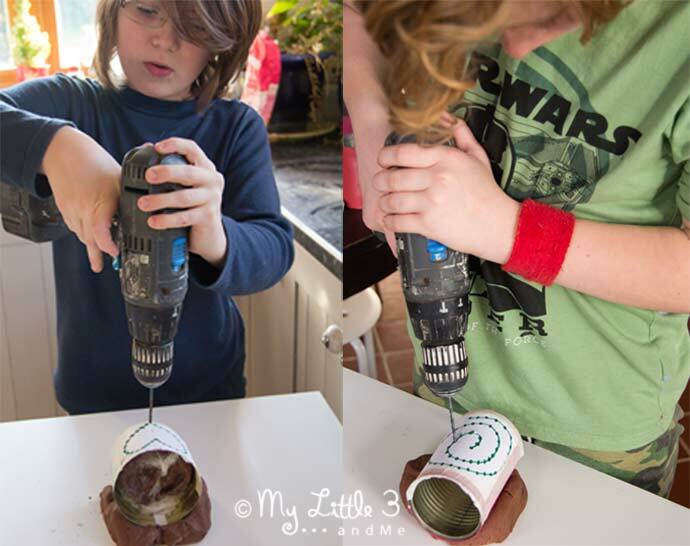 You could make these pretty tea light holders with younger children too with a bit of support. I’ll talk you through everything below. Washed and dried tin cans from your recycling bin. I’m so pleased with the beads I got for this craft idea. They are so pretty and just make the finished piece so special! First of all we needed to wash and dry the tin cans really well. This was actually the only bit I didn’t let my children do themselves because the edges can be a sharp if you rub your fingers across them. Now I know how beautiful these tin can lanterns look I’ll be saving different shapes and sizes of cans from the recycling bin throughout the year. I’d love to find some really big ones! The children used a basic acrylic paints set to mix up the shades of paint they wanted for this craft project. I love the shades they chose. With them being boys I thought we might end up with dark greys, blacks and browns but they seemed really mindful of who the gifts were for and were inspired by the prettiness of all the beads too. We needed two coats of paint to cover the tins properly. If the lanterns are going to be used outside then you’ll need a more long-lasting waterproof paint, or you could try varnishing them when they’re finished. Once the paint was dry, the children sketched out a simple design for the front on a piece of paper. 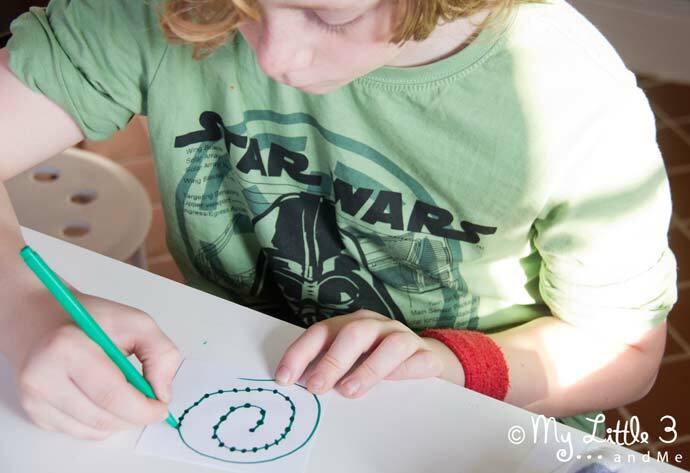 At first they were drawing designs that were far too complicated but once they marked on dots where they would need to drill they realised that they couldn’t have the lines too close together and just how many drill holes a complicated design would need! In the end they chose a star, heart and spiral. Next we taped the paper design onto the front of the tin can, with some masking tape, avoiding the seam. To make it more stable for the children to drill I stuck the tin onto the table using some homemade play dough. This worked really well but you’ll need to throw the play dough away after as it will have tiny metal shavings in. If you don’t have play dough you could support the tin can with a rolled up tea towel. To begin with I put a bag of play dough in the tin can too thinking this would help stop the can caving in as the drill pushed through but we actually found this wasn’t necessary and the drill went through with hardly any pressure need at all. The children worked their way around their design drilling each hole carefully and adding an extra one on each side for the handle to be attached. Before they started they practised holding the drill vertically and starting it really slowly then building up speed. We also had a quick trial run on a spare tin can before they started on their design. I made these homemade gifts with my two boys aged 8 and 11 and once I’d shown them how to use the drill safely they were able to do it all independently. 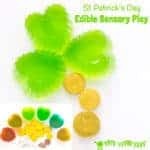 I’d be happy to do this activity again with younger children too but might opt to hold the drill with them. Top tip – make sure your drill bits are suitable for metal, and sharp! You don’t want to have to push hard on the tin can incase the drill bit slips off to one side. 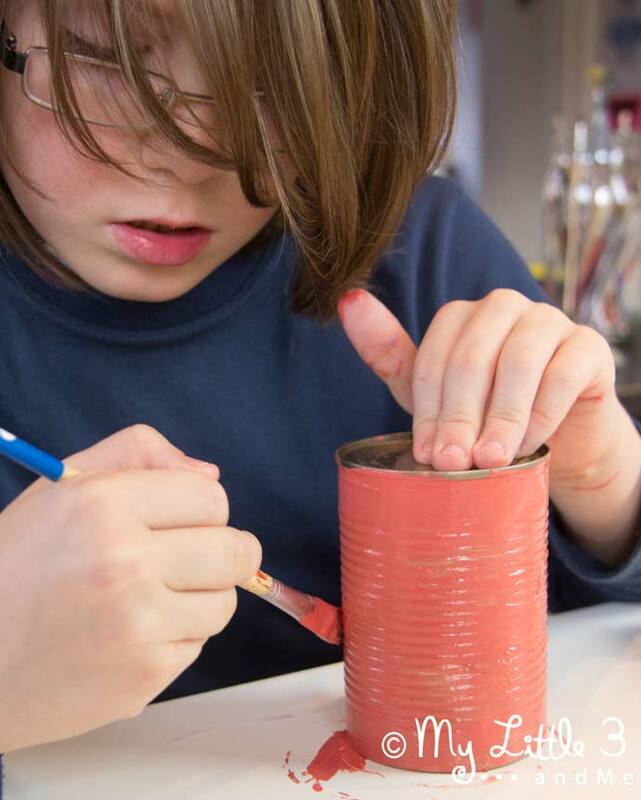 Once the tin can lanterns had their designs drilled in, the children set to work making their handles. We cut a short length of wire about 10cm longer than needed so that there’d be spare for securing the handle to the tin can lantern. 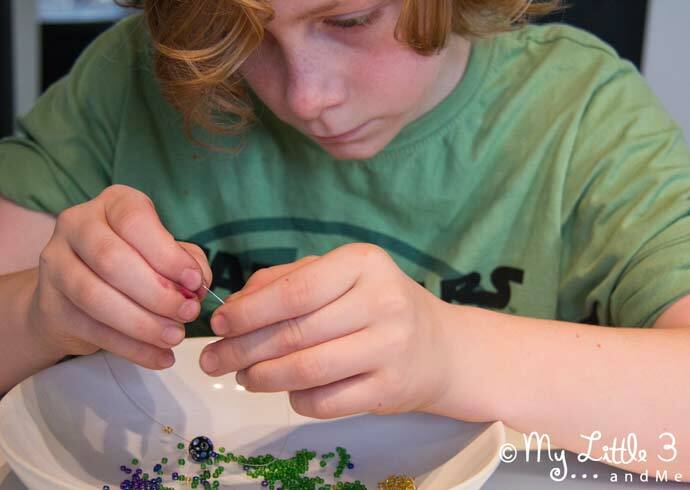 The boys then threaded up the wire with the seed beads and 3 of the gorgeous glass beads. We had to use really thin wire for the seed beads so this meant that it would only take the weight of 3 or 4 of the larger glass beads. Once they’d finished threading the lantern’s handle we threaded it through the holes in the side of the can and secured it into place by wrapping the excess round and round the handle. 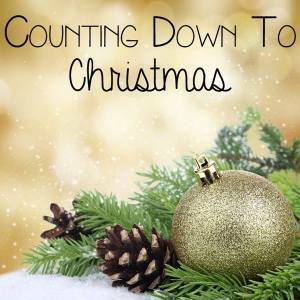 We love creating handmade gifts and this craft idea for kids is our contribution to the Counting Down To Christmas series organised by the lovely Cerys at Rainy Day Mum. Last week we teamed up with other wonderful European bloggers to bring you paper crafts and our pretty Paper and Bead Ornaments. This week we are all sharing wonderful Homemade Gifts that you and the children can make for that someone special. 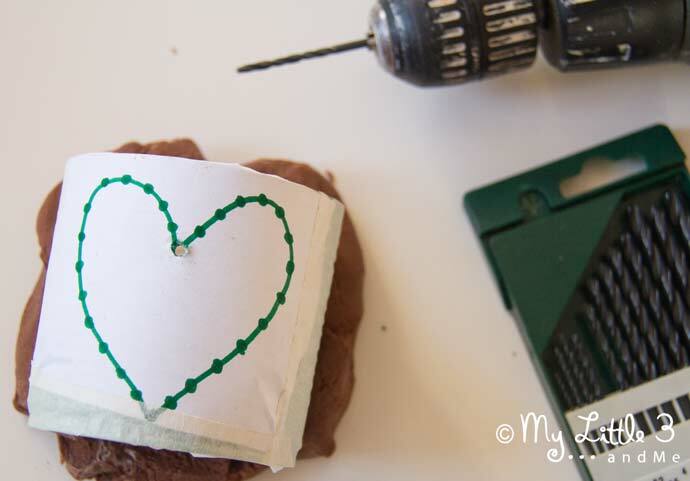 Take a peek at the link up below to see what everyone else is making and why not join in too? We’d love to see what Christmas crafts, recipes or gifts you’ve been making too. Before you go, here’s a couple of our fabulous Pinterest boards that I’m sure you’ll love. They’re bursting with ideas to keep you and your little ones having fun over the festive period. Follow My Little 3 and Me’s board Christmas for kids on Pinterest. Follow My Little 3 and Me’s board Gifts For Kids on Pinterest. Great Project! 🙂 Either way Safety First. Should have protective eye glasses on! These are beautiful Emma! Good job boys! I really like these – we made something similar a few years ago when we were on holiday. We use electric tealights or torches in them too if they are in the kids bedrooms rather than a naked flame! These look lovely! I can almost imagine them during summer time in my garden. Perfect decoration. These are beautiful. What a briliant idea, I love them. Thank you Globalmouse. They were fun to make. These are gorgeous – what a lovely idea. Pinning for when my son is older! What a completely gorgeous idea! My son is a little too young to handle a drill, but maybe Daddy can do it for him. I have done these by filling cans with water and freezing, then you have ice and can punch holes with a hammer and nail. Now this is something younger children could handle. Me too! It always feels great when you can reuse something creatively. Ooh I’ve got got a little tool that may work on this rather than using a drill. 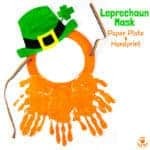 what kind of tool as I am looking to make these with some youngins in the childrens home. 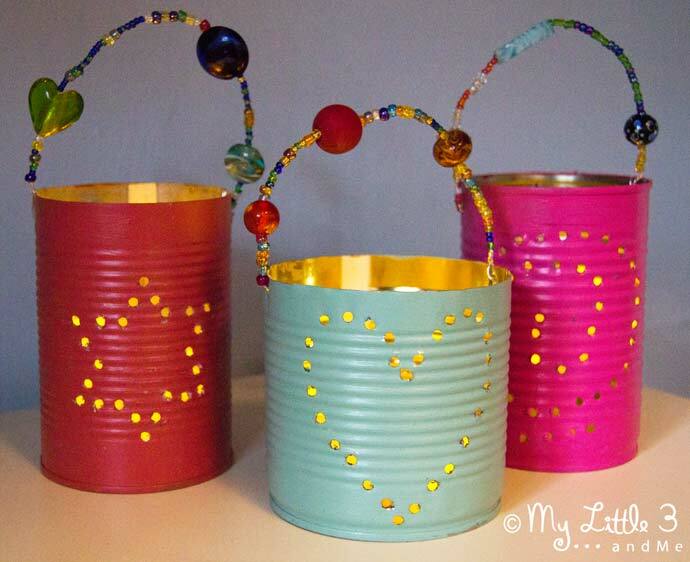 I love tin can lanterns and these are beautiful. Those look fab, and how much fun to get the drill out too! My twins would love making those. these look gorgeous – top marks on the craft front to you! I love these – we made some in the summer freezing the water and then using a screw (the pointy part helped :D) to hammer the holes through with my preschooler. Would love to try with my older one using a drill I know he would love it. These look amazing. When we made ours last year we filled with water and froze them before hammering nails in them. I am wondering if drilling them would be easier or if my boys are a little heavy handed it might be worth freezing water in them before trying.